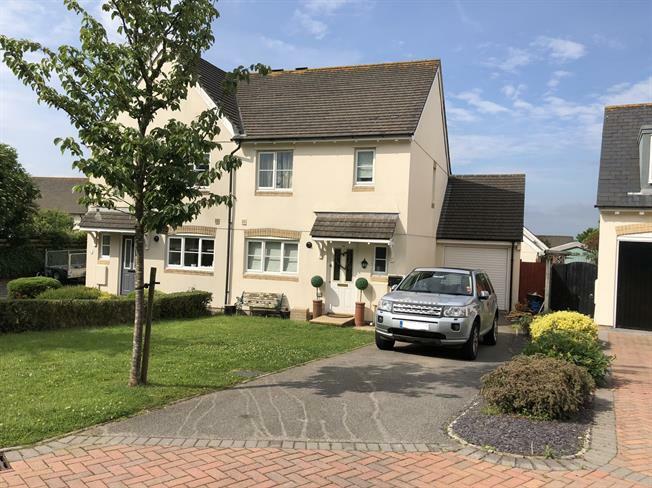 3 Bedroom Semi Detached House For Sale in Bodmin for Asking Price £199,950. Situated in a small cul de sac location at Rowan Close, this semi detached three bedroom property has an attached garage with driveway parking to the front with lawn to the side. On the ground floor there is a fitted kitchen, an open plan generous lounge/dining room with patio doors to the enclosed rear garden, and a cloakroom. The first floor offers three bedrooms, master with ensuite shower room, and the family bathroom. The property also benefits from gas central heating, double glazing and is offered with no forward chain. Agents note - internal photographs taken 2016. Maximum measurements to include under stairs storage cupboard. Maximum measurements to include part of ensuite.